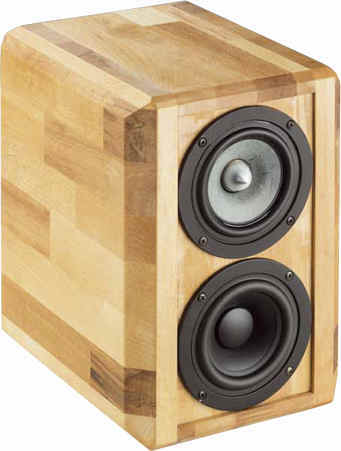 Double Four is an 2 way compact FAST (Fullrange and Subwoofer Technology) speaker with Tang Band drivers. The kit is delivered with Tang Band fullrange driver W4-1320 SIF and a Tang Band woofer W4-1720 for the bass range. The shelf speaker employs bass reflex technology. Double Four has been developed by Thomas Schmidt. The crossover consists of a 2nd order high-pass filter (12 dB per octave slope) for the fullrange driver. The woofer is connected to a 2nd order low pass filter (12 dB per octave slope). The frequency response of this speaker is nearly linear below 7 kHz. Above 7 kHz the non-linear frequency response is typical for full range loudspeakers. The decay spectrum is nearly perfect. At low volume, i.e. 85 dB at 1 m, the nonlinear distortions are lower than 0.5% above 300 Hz and doesn't exceed 0.7% at 95 dB at 1 m between 300 and 15000 Hz. The high-end kit is delivered with a baked varnish coil in series to the woofer for minimizing microphonic effects. - The current flow through the coil creates a magnetic field which sets the reel of wire in motion. This motion induces a voltage in the coil which adds itself to the signal. The stiffer the reel of wire is, the less the signal will be altered. The capacitor for the fullrange driver is of type polypropylen (MKP) Clarity-Cap PX 250 and for the woofer a Clarity Cap PWA 160.